Andrea and Laura are offering a wonderful Gift basket valued at $300. Metis Linens Giveaway Basket !
" It was a very natural thing, we weren't really looking to "start a venture" we both just happen to love the vintage French fabrics. We were talking about the grain sack look being on the wane, and why isn't there anyone doing vintage cotton & linen blends (known as Metis). Laura & I work very well as a team, each bringing our own style to the mix. " These beautiful Beeswax candles wrapped in silk corded French Medals with Jewels. Hint: Can be wrapped around dinner napkins and then given as gifts to your guest. Also fabulous as a silk corded necklace. 1) Become a follower on my site Art by Karena or let me know that you are. 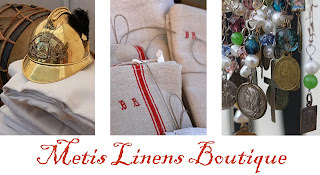 2) Visit Metis Linens (so much more to see) and come back to comment on what you love best on the site. The Winner will be chosen and announced on November 1st!! Look for a superb surprise Giveaway this week, I am so excited and I know you will all love it. Become a follower and you will be ready to comment! I am featuring a painting that is in mid stage. There is still some glazing and depth to add. 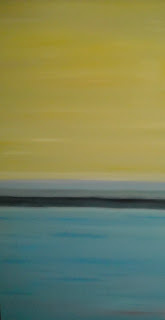 It is created on a Signature Canvas which is Linen & 3 inches deep, 48 H x 24 W. It will hang on a Peacock Blue wall until sold, or shown in an upcoming exhibit. The cropping is skewed a bit, I am not an expert photographer yet!! The Inspiration for my next painting comes from this fabulous portrait , recently discovered, done by Boldini, a student of John Singer Sargent. Breathtaking!! Auctioned for nearly 3 million. The woman in the masterpiece proved to be Marthe de Florian, an actress whom the genre painter had a relationship with. The owner was the granddaughter of de Florian. The authenticity of the canvas was confirmed by Marc Ottavi, an art expert although he also adds that the portrait was never exhibited or listed in any reference books. For 70 years, the apartment of the granddaughter of Marthe de Florian, a beautiful actress of the early screen, lay untouched. The rent was paid, the doors were locked, but no one went inside. Until the 91-year-old passed away, and the rooms of treasure were discovered by experts sent to inventory her belongings. 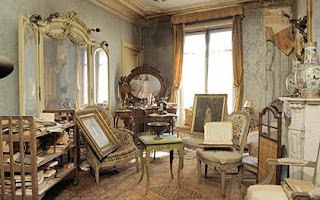 The apartment held various items from before WWII; de Florian had left Paris before the war, and never went back. There were toys and a vanity, furniture and art. 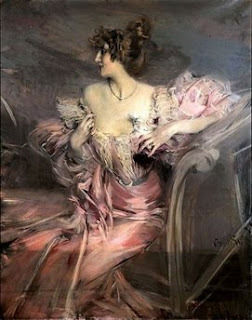 But the most shocking and cherished of items was this before-unknown painting by legendary painter Giovanni Boldini. It is October 1st and I am supporting Breast Cancer Awareness Month. Please urge all of your friends and family to have their annual mamograms. Even the name celebrates the power and essence of women! Now the exciting news is that we have a winner of my contest with The French Basketeer! It is Brooke Giannetti from Velvet and Linen. Her fabulous site Velvet and Linen is one you simply must visit. As soon as you do you will see what I mean. You will find a wonderful mix of Old World as well as Chic Industrial pieces. 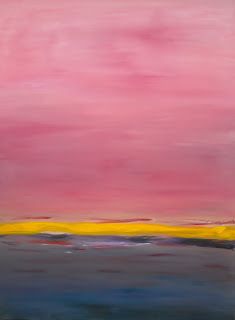 Brooke's husband Steve paints amazing seascapes. A huge Thank You to a most generous woman, Andrea proprietress of The French Basketeer! Thank you so much to all of my loyal friends and supporters and look for more great giveaways to come!! 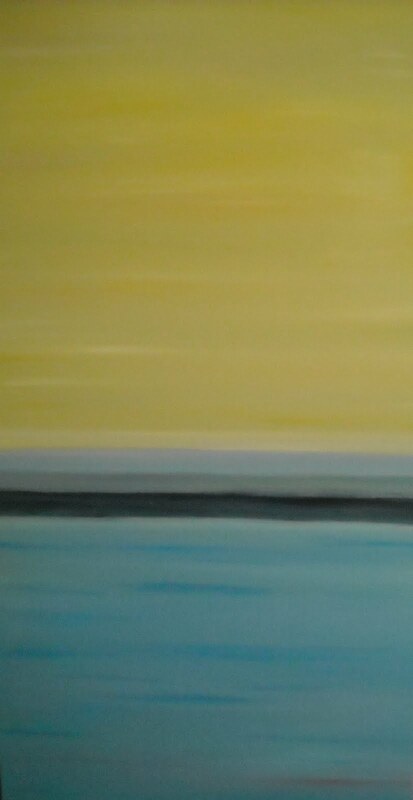 I will also be painting again after a hiatus this summer for several surgeries and healing!